Anyone who has toured America’s midcentury modern sights will recognize the honey locust tree (Gleditsia triacanthos) at once. It can be seen around the Illinois Institute of Technology in Chicago, outside the Miller House in Columbus, Indiana, and even in the heart of Manhattan at Paley Park. The honey locust’s native range extends from western Appalachia to the Great Plains, with the highest concentration on the limestone soils and stream banks of southern Indiana and southern Illinois. It was here, in the Midwest, that the honey locust first caught the attention of the burgeoning modern design movement. The fruit of the tree is the long, twisted seed pod, which forms in late summer and turns from green to reddish brown as it matures. The pods emit a sweet aroma when they ripen and are sometimes eaten by livestock and wildlife. In his 1939 book, Siftings, Prairie School landscape architect Jens Jensen wrote, "There is a certain refinement about this tree, and in its golden-yellow autumn color it gives a soft light to the landscape." 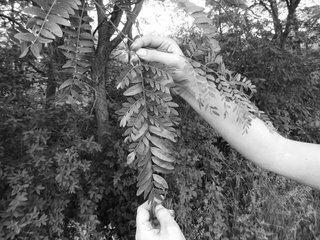 Jensen further described the honey locust’s common situation along the edges of forests: "Down in central Illinois the honey locust is at home, and in some sections is known as ‘The Farmer Wife’s Tree.’ This name has been given to it because of the fact that . . . it was the farmer’s wife who went into the wooded areas along the prairie rivers for locust saplings." It was beside such a country fencerow that Alfred Caldwell, who had worked with Jensen, planted some of his first honey locusts at his Wisconsin farm in the early 1940s. The honey locust is a deciduous tree, with a mix of pinnately and bipinnately compound leaves that turn bright yellow before they fall in autumn. 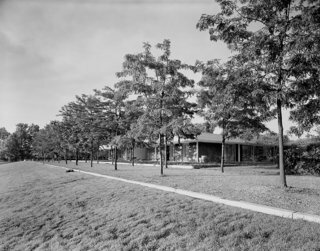 Caldwell became a proponent of the species and later shared it with Mies van der Rohe when he collaborated with the modern master to create "a campus in a park" at the Illinois Institute of Technology. Caldwell’s planting scheme for S.R. 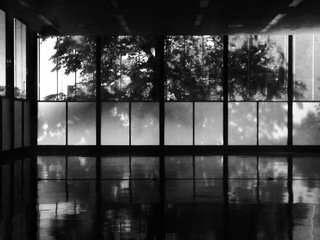 Crown Hall is defined by irregularly spaced honey locusts underplanted with hawthorn masses. Caldwell may have purposely selected the most gnarly specimens at the nursery so that their form would stand in sharp contrast to the gridded orthogonality of the campus plan and buildings. Around the same time, another important development was occurring with the honey locust. In 1949, a thornless, seedless variety of the species was patented by the Siebenthaler Company in Dayton, Ohio. 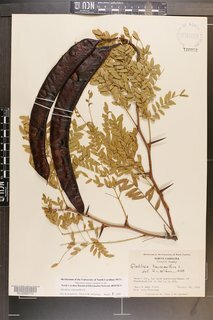 Gleditsia triacanthos inermis, as it is known, was the first patented shade tree in North America, and at the peak of its popularity, 75,000 were sold each year. It was the new variety of honey locust that the influential landscape architect Dan Kiley, who designed more than 1,000 projects worldwide, selected for some of his best-known work, including Eero Saarinen’s Miller House in Columbus, Indiana. In contrast with Caldwell’s irregularly spaced groves, Kiley chose to array the tree in an orderly allée of two equally spaced rows. By the mid-1960s, the honey locust had become commonplace. However, one last project from this period, far from its Midwest seedbed, made perfect use of the tree’s sinuous trunk, picturesque branching structure, and bright fall foliage. At Paley Park, amid the bustle of midtown Manhattan, Zion & Breen Associates designed a soothing oasis with tables and chairs, where pedestrians can mingle beneath a finely textured canopy of honey locusts. How wonderful, Caldwell had earlier mused, to see the world filtered through its leaves, "a kind of mysterious continuum of light and shadow." The honey locust tree became prevalent in Midwest horticulture after the demise of the American elm tree due to Dutch elm disease in the early 20th century. Loved by landscape architects Alfred Caldwell and Dan Kiley for its slender trunk and thorny branches, the tree is a natural foil to some of the most highly regarded buildings of the era, including S.R. Crown Hall at the Illinois Institute of Technology.